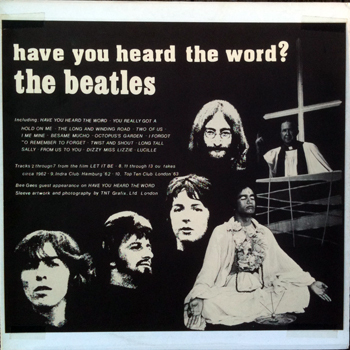 Title LP: Have You Heard The Word? Track 1 by The Futz. All other tracks by The Beatles except tracks 2 and 9 by The Beatles with Billy Preston. Tracks 2-9 from the Let It Be film. Track 10 from BBC Radio From Us To You. Tracks 11-12 from Swedish TV Show Drop In. Track 13 is actually the studio master with artificial clapping enhancement. Track 14 from BBC Radio's Beatles Invite You To Take A Ticket To Ride. Track 15 from BBC Radio's Saturday Club. Tracks 1-9 on side 1 and tracks 10-15 on side 2. Estimated release date.